As England’s new football strip – made by Nike – is revealed today, new research shows the English FA are now second in the world in terms of income from their kit manufacturer. England’s deal with Nike is worth €30m (£25m) per year, and this is beaten only by the £36m per year deal that the French FA have, also with Nike, according to figures compiled by the veteran analyst Dr Peter Rohlmann and his team at the consulting bureau, PR Marketing. Germany has the third-highest deal (with adidas), ahead of Brazil in fourth, then reigning world and European champions Spain in fifth, with Italy, Russia, the Netherlands, the USA and Argentina filling out the world’s top 10 most lucrative supplier deals in international football. A nation’s ranking in the world is less important than its ability to sell shirts across a broad demographic. According to sources close to the FA, fans buy approximately one million England shirts a year, with that figure rising to three million in years when the Three Lions qualify for the World Cup or European Championships. The sales figures make the England shirt among the most popular in international football and help explain how the FA managed to negotiate the lucrative deal with Umbro, which was subsequently acquired by Nike. England’s new kit was first revealed today in a Twitpic (right) by Arsenal’s Jack Wilshere (kit worn by a pupil at his old school), and will be used by England for the first time on 29 May against the Republic of Ireland, and against Brazil in the Maracana on 2 June. While a lift in sales is expected from the ‘Nike factor’, sales figures are expected to remain generally in line with recent sales trends. The sales figures also demonstrate the potential loss of revenues should Roy Hodgson fail to steer England to next year’s World Cup in Brazil. 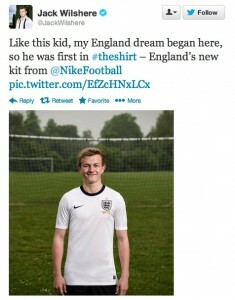 The new nike kit signals the end of a 59-year association between England and Umbro. The company first provided an England kit in 1954, a lightweight white v-neck, although used Admiral from 1974 to 1984. Another article elsewhere on this site explores the value of football shirt income to clubs and to the major brands. Manchester United and Real Madrid lead the way in sales of club shirts: as Sportingintelligence detailed last October, they have sold an average of 1.4m official replica shirts globally each year in the past five years.